It took us 30 minutes to reach this small village in a minibus using old roads snaking from village to village until we reached Wadi Rahhal, [population 1,300]. The traditional road from Bethlehem takes 10 minutes but that road had been ‘confiscated’ for use for Israeli settlers only. 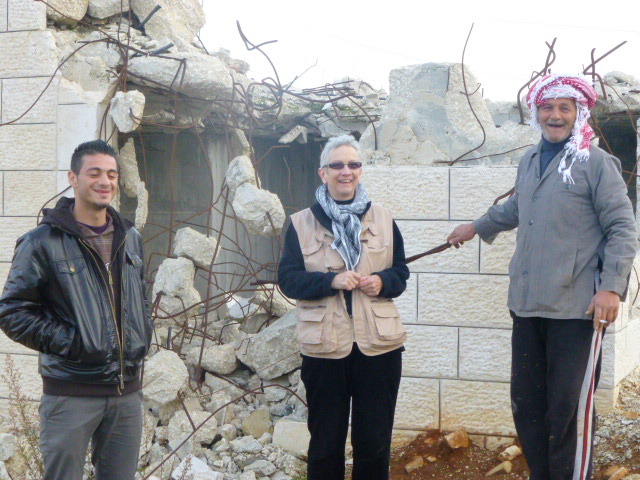 They have a large [housing estate] settlement on agricultural land they took from the village, illegally. I drank tea in Anas’s home and met his mother before we went walking around the village whilst hearing how it has changed. Anas pointed to an area beside the Israeli settlement and said “When I was a child my family used to go there for BBQs and I played in the forest there.” Now the forest has been destroyed and the area is an Israeli ‘security zone’. To claim land the occupying forces have used bulldozers to raze agricultural land and uprooted 500 olive trees, 200 grape vines 150 stone fruit trees along with over 150 other trees. They also use bulldozers to demolish houses. See picture below. Some villagers keep sheep, goats and even a few beehives. There are crops of tomatoes, cucumbers and a small amount of cereals growing in the remaining land. Residents say control of water has been taken from the village for the huge settlements and sold back to the village at a high cost. In summer the villagers have water if it is not all used by the settlers. The kindergarten was built with the help of World Vision. And there is a school for over 400 students which may soon have some rebuilding done with the help of US Aid. The school is about 10 meters from the proposed segregation wall. 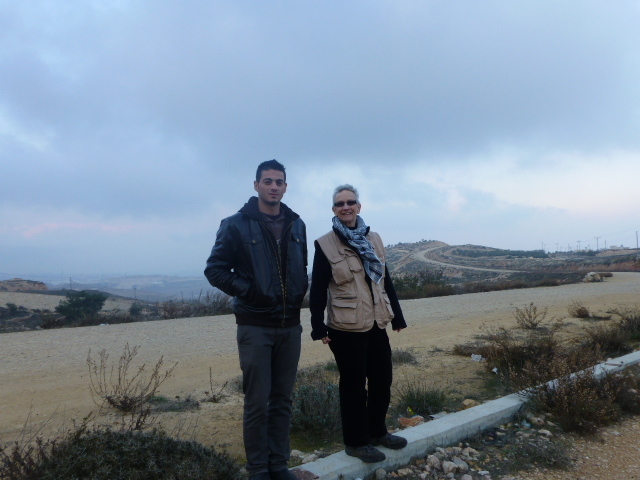 In the photo below, the road behind us is the foundation for the Separation Wall, 10 metres in front of us is the school. Parents say the wall is already having an emotional impact on their children. I was told “I hope we can release the stress. I hope to have good children with no psychological problems and good mental health”. The standard of education appears to be good with several children gaining University places each year. I have been told “they won’t get work but will have an education for when freedom comes. When the Israelis go home we are prepared”. Hmmm. Last year there were 400 graduates from Bethlehem University. 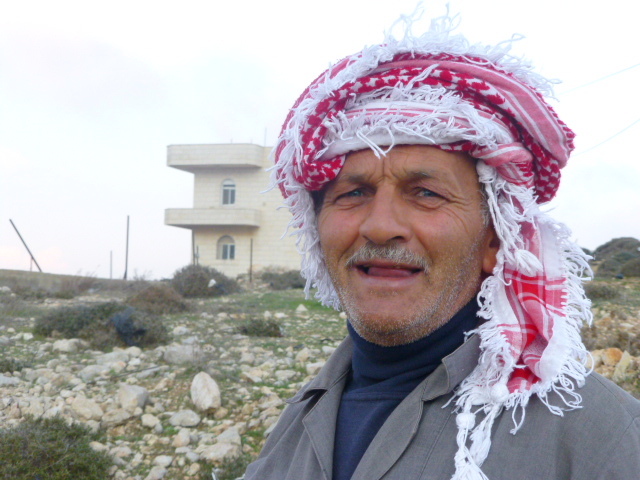 Again, I have been told “Only 10 of them got jobs in the area of their education.” The photo below shows Wadi Rahhal’s first university graduate, who is now a retired principal. Wadi Rahhal volleyball team has been the champions of South Palestine for the past 6 years, and they have a football team and a girls under 14 yrs volleyball teams. I am so impressed with the people I meet. I asked Anas what he thinks of the Israelis. When I asked if the villagers thought to protest he said “We did in the past but we were threatened, they will shoot us, we have not got guns. we are peaceful people”. This entry was posted in Access to resources and tagged bethlehem, education, Separation Wall, southern west bank, wadi rahhal, water by EAPPI. Bookmark the permalink. attention-grabbing article like yours. It’s lovely worth enough for me. In my opinion, if all web owners and bloggers made just right content as you probably did, the internet might be much more helpful than ever before.